Not any more. Though running always will involve pain, Cindy and I look past that to the prize. Not that we ever win anything. The prize is the satisfaction of pushing our bodies past what is comfortable. The prize is the joy we feel in trying to stay ahead of old age as long as we can. The prize is applying the verse, “Whatever you do, do all to the glory of God” to disciplining our bodies. And for the last few years, the prize for me has gotten sweeter as my lovely bride has become a runner girl. She has run several races, but none more than 5 miles. Until last Saturday, when we ran a half marathon together in Raleigh. Cindy had been training for months, following the Hal Higdon plan for novices. Six weeks ago we decided that this was it. Training is good, but unless you have a goal you are straining to reach, then what’s the pain for? As Dale Carnegie said years ago, “If you aim at nothing, you’ll hit it every time.” We paid the money to run the race and to experience the pain. That reminds me of a sign we saw near the finish line that some spectators were holding up. It said, “You paid all that money and went through all that pain . . . for a banana?” Not funny. It was a sunny day, with temperatures in the high 60s when we started. The humidity was over 90 percent at 7 a.m. when we started running, and may have plummeted to 80 percent by the time we finished. As we ran along together with thousands of strangers, we quickly became close through our suffering. Strangers turned into friends, especially in the first seven or eight miles, when we had enough breath to actually speak. As we neared the 8-mile mark, Cindy was starting to experience leg pain and overall fatigue, so she asked me if I could recite some Scripture that I have been memorizing. I did, and that accomplished two things. It helped two miles pass with our minds concentrated on something besides our pain. And it got us some strange looks from people passing us by. The race planners in Raleigh have a cruel streak. The last half-mile, Lassiter hill, is brutal. We walked up most of it, and when we crested the hill and saw the finish line ahead, I grabbed Cindy’s hand and we started running. 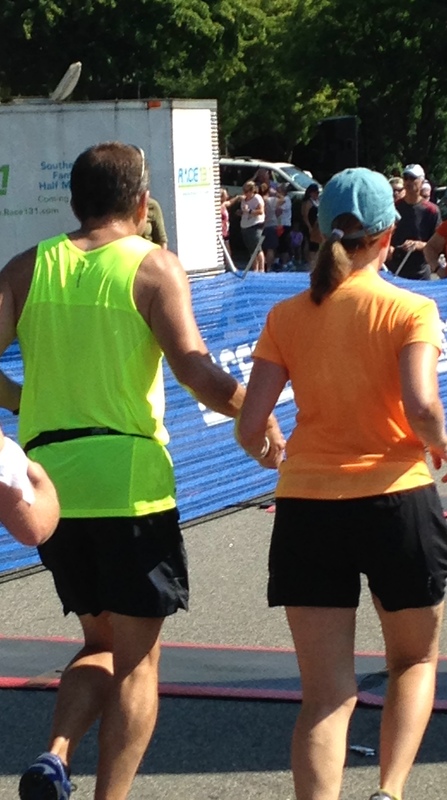 We crossed the line together, smiling, rejoicing that we had finished and that we had not signed up for a marathon.